I was in Nepal a few days after April 25th, 2015; I've returned several times since and am back again to see how rebuilding work is progressing. I've worked for several agencies and NGOs in the past year, including Getty, Splash, Global Giving, Charity:Water and others. All the NGOs I've worked for are doing impressive work in the region and I'm proud to be helping them share their stories. 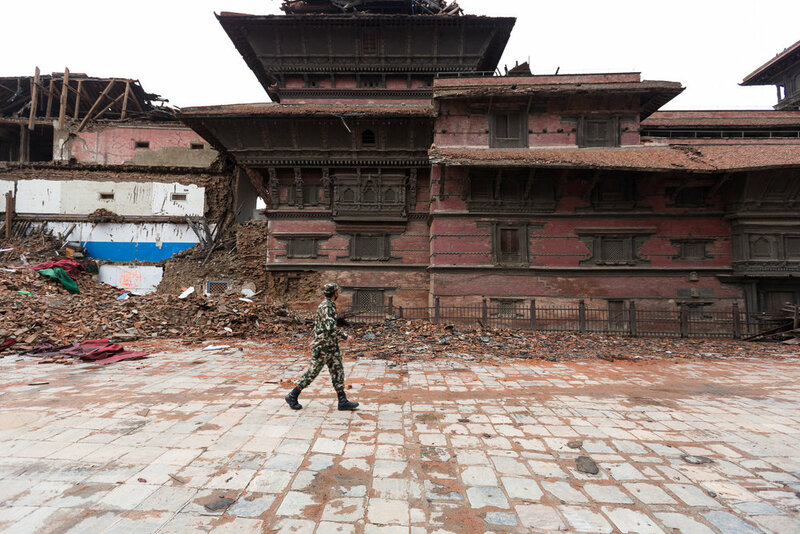 Bhaktapur, a city about an hour from Kathmandu, was one of the areas hardest hit by the earthquake. The city is a UNESCO World Heritage site and home to several ancient temples, some of which were destroyed. Many homes in the city were old and vulnerable and were either destroyed or left in a state too precarious for habitation. Many homeless families have left the city to live with friends or family and those who have stayed are living in temporary shelters. The word "temporary" in that last sentence has an elastic definition. Where home owners and neighbours were sifting through the rubble last year, searching for survivors and trying to salvage possessions, in 2016 the same sites are being slowly prepared by hand. These workers are employed and paid between 500 and 1,000 rupees (just under US$5-$10) per day. In these before & after photographs, it's possible to see how the debris and rubble have been cleared away from the pavements and some buildings have been torn down. Many of those that remain are still unsafe and those that were flattened have yet to be rebuilt. Kathmandu's Durbar Square is another UNESCO World Heritage site and probably the most famous site in Nepal. Several ancient temples were destroyed or badly damaged. Repairing and rebuilding such unique structures must require careful planning and well-managed execution if the integrity of the architecture is to be maintained. However, one group of students I spoke with blamed the Nepalese Government for not distributing the funds required in a more timely fashion. "We are embarrassed for Nepal", said one student. Fellow students nodded in agreement as she continued, "This is our culture and our heritage. How can it be left like this? Why are our politicians not ashamed?". The Kumari House, one of Kathmandu's most sacred buildings and high on the list of 'must see' tourist destinations has reopened. The debris has been cleared away, the pavements are open to pedestrians and the facade is now supported with wooden beams. There is evidence of rebuilding in some homes, certainly not all. 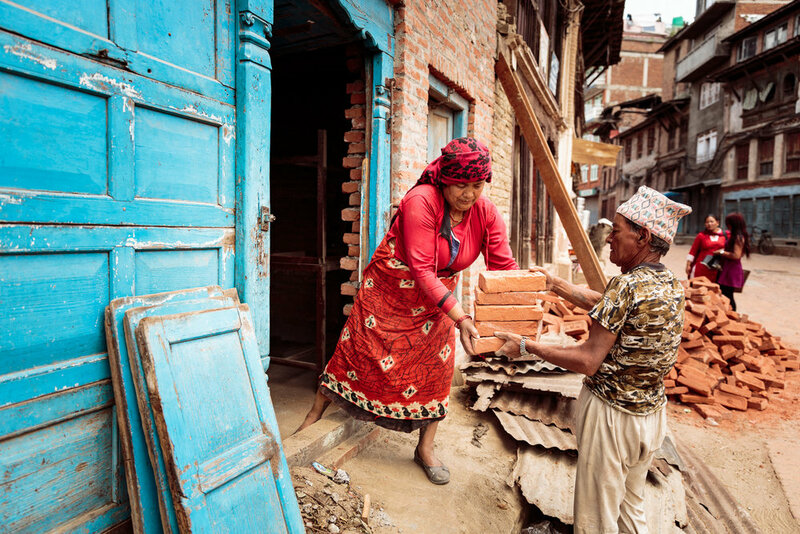 Here in Bhaktapur, Sundari carries bricks into a building and prepares cement for the bricklayer. It doesn't look like easy work. Mixing cement by hand is an arduous task. 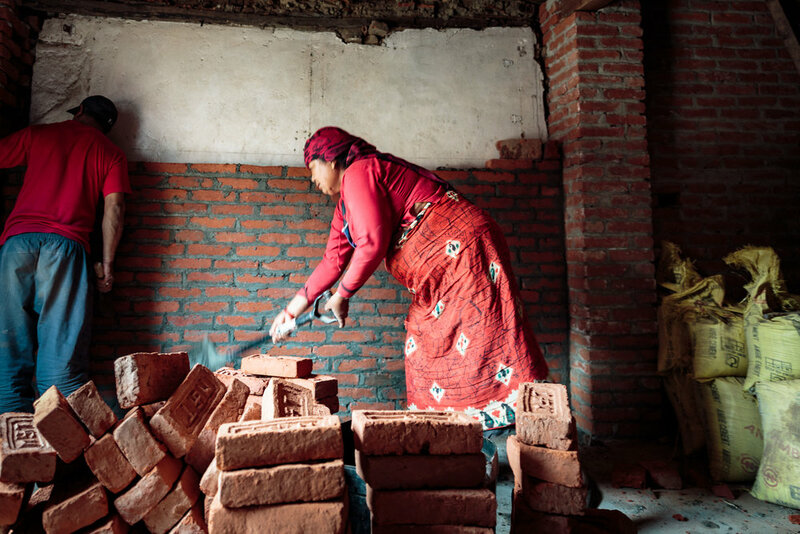 Women typically receive 500 rupees per day for labouring work. Men receive about 1,000 rupees. There is no obvious division of labour, other than women seem to do most of the lifting. When asked why women get paid less - or why men get paid more - the answer was invariably a shrug of the shoulders, "Because that's the way it is". Typically, it is women who do much of the building work whilst they also take much of the responsibility for maintaining some community cohesion. Whether it's people like Sundari, carrying bricks and mixing cement, her colleagues (pictured below) carrying hods of bricks and ballast or women like Sukla Laxmi and her friends. Mothers and grandmothers, their families left homeless, yet somehow successfully keeping their families together. 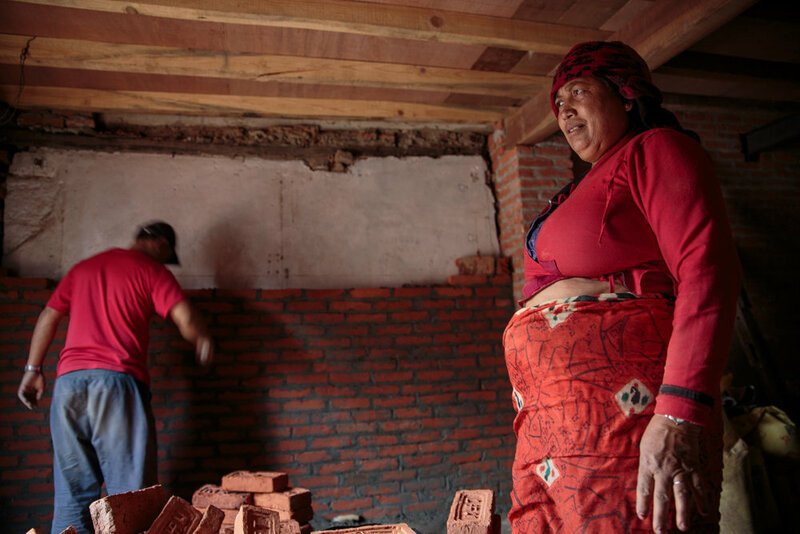 Sukla is typical of many of the Nepalese women I meet in the temporary shelters and camps. She's kind of bossy but laughs a lot. "You take my picture here" she tells me. "Now wait here, I'll get my friends". I don't mind being bossed around because Sukla is laughing all the time and the bystanders know that we're playing up for laughs. "OK. Take our picture here." she tells me. "Well, the light is better here", I suggest. She squints at me, weighing me up, calculating whether I look like somebody who knows what they're talking about. "Hmm, OK." She relents but is quick to check my work in the LCD screen of my camera. "Why did you cut off our legs?" she demands in mock, theatrical indignation. "So that we can see your beautiful face more closely" I counter quickly. She doubles over in laughter, we all take our cue from her and our laughter echoes between the corrugated iron shelters. "You are too funny" she tells me. "You're too funny too", I say but, silently, I think to myself, "And you, my friend, are the glue that keeps this community together". I show the women my phone and a photo of a girl I photographed at the same location in 2015. Sarmila was playing at her grandparents' home when the earthquake struck at four minutes to midday. The home was destroyed. 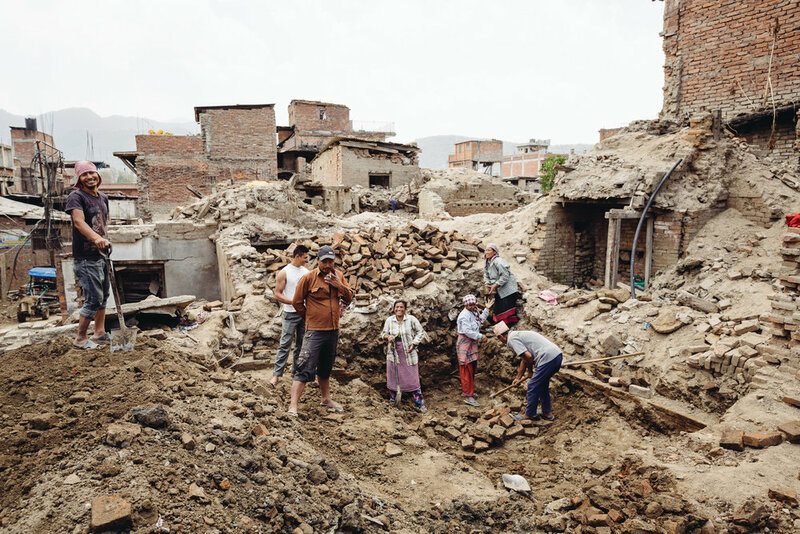 Miraculously, Sarmila and her grandparents survived and when I met them, they were painstakingly sifting through the piles of rubble that once formed the family home. "Sarmila is away", they tell me. "But we will call her'. They take a note of my phone number and promise to call me. It seems like a long shot so I say my goodbyes and head off, not really expecting to hear any more. A few hours later, my phone rings. Sarmila is on the other end of the line. "I am home now" she says. "Are you coming to see us?" Twenty minutes later, I'm back at the camp and Sarmila, now 14, her older sister Rasmila (17) and their entertainingly cheeky brother Samir (12) are waiting. I spent some time with Sarmila and her friends in 2015. In the midst of the devastation, having spent many hours moving the rubble of their former home by hand, I think they were pleased to have an excuse to play for a short while. It's hard to imagine having to take on the very grown up responsibilities of salvaging belongings from a wrecked home, fetching water several times each day from the communal tap and caring for younger children in the camp when you're barely even a teenager yourself. I'm pleased to see Sarmila looking much less tired than she did a year before. A happy, carefree childhood is a precious thing and something of a rarity in Sarmila's community. The kids insist that I follow them through the maze of alleyways to their parents' home. Although it was not destroyed in the earthquake, it shows signs of disturbance. The walls are cracked and the narrow, wooden stairs are leaning at an alarming angle. I'm not confident that they will bear the weight of a lumbering photographer (it's the cameras and lenses that weigh so much!) so I step gingerly up each staircase, worrying that I might fall through at any moment. On the fourth floor, I meet the children's parents, who invite me to sit and share a drink. Cheeky Samir remembers using my cameras last year and is keen to continue his photographic education. He shoots these portraits of his mother, sister and me, which, I have to say, are really impressive. We talk about the earthquake, about their grandparents, about school, about life in Nepal and how it compares to life in other other countries. Such a generous and hospitable family and certainly no exception in Nepal. When I relate such stories to friends at home, I'm often asked what the family wanted from me, as if there must be some ulterior motive. The truth is that Sarmila's family don't want anything from me beyond my time and respect. They're interested in my life, just as I'm interested in theirs. They want to demonstrate their hospitality but it is not forced, it's given willingly and without any expectation of anything in return. No money changes hands, I'm certain that they would be offended if I was to offer and I've learned that, even in what we might consider trying circumstances, people appreciate being seen for who they are, not as a charity case. Samir helps me shoot a quick portrait of each of his sisters and poses for a final portrait himself before I realise that the light is fading and I still have to get back to Kathmandu. The stairs squeal but hold up as I descend and Samir leads me back through the alleyways towards the town centre. Soon after saying goodbye to Samir, I meet Laxmi and her daughter Shambridi sitting outside a tent. 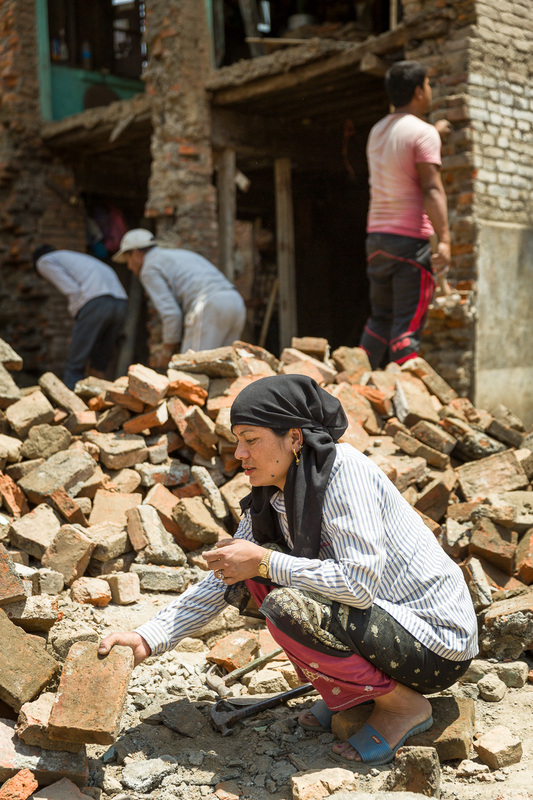 Laxmi explains that her daughter was not even four weeks old when the earthquake struck. They've lived in the tent outside their broken home ever since. The upper floors of the building collapsed. Fortunately, at midday on the day of the earthquake, Laxmi and Shambridi were downstairs. Had the earthquake struck at another time of day, they might not have been so fortunate. This is a story I've heard many times from people who were outside because it was lunch time on a Saturday. On a weekday, children would have been in their classrooms. Families might have been asleep in upper storey rooms if the earthquake had come at night. The number of fatalities might have been so much higher and families might not be so fortunate should a similar event strike in the future. 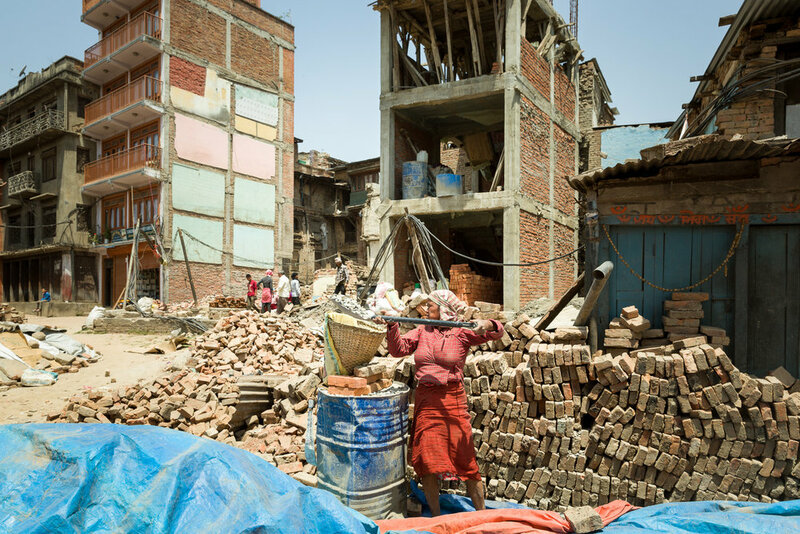 Having homes built to a reasonable standard in a region prone to seismic activity would seem like the very least residents might reasonably expect but, sadly, in Nepal, that's unlikely to be the case. 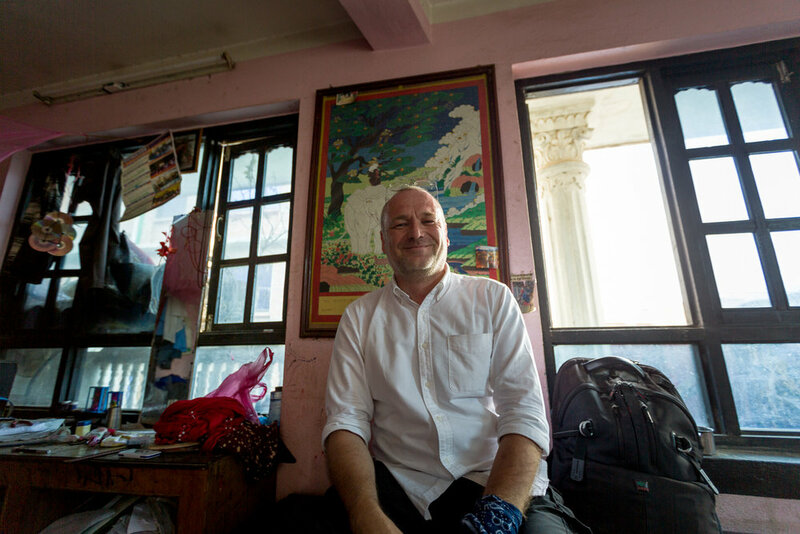 I spoke with a structural engineer who explained that most Nepalese homes are vulnerable to earthquakes. "They're built with brick", he explained, "but the cement is not strong and there's very little reinforcement. It's essentially like living inside a giant Jenga building where any sizeable vibration is likely to see the structure topple". I'm remembering his words as I photograph little Shambridi. It's hard to think that she might actually be safer in a tent. Laxmi and Shambridi outside the tent they've lived in since the 2015 earthquake damaged their home. 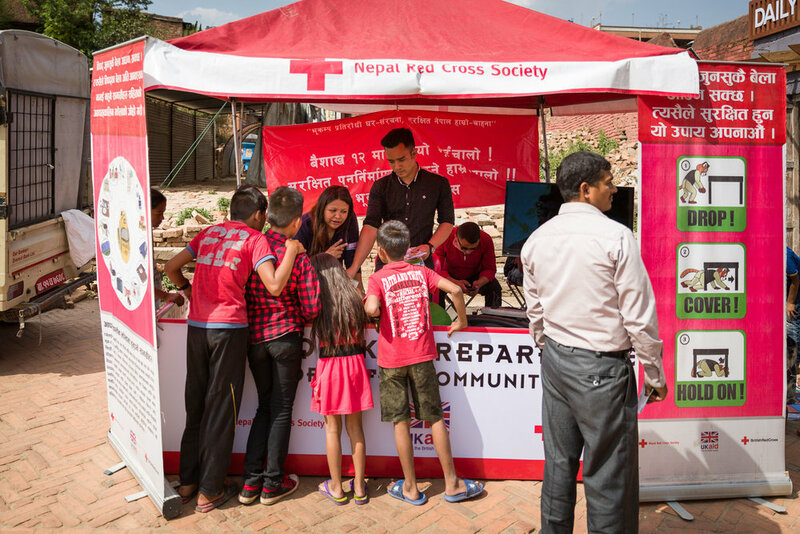 In the town's central Durbar Square, the Nepal Red Cross Society have set up a mobile kiosk and are distributing information leaflets. The leaflets advise how to pack an emergency bag to be used in the event of another earthquake. Experts suggest that last year's earthquake was probably not the "big one" and that a larger event is almost certain to strike the region in the future. It's a sobering prospect. It also strikes me that this is the only evidence I've seen of an NGO working in the area. 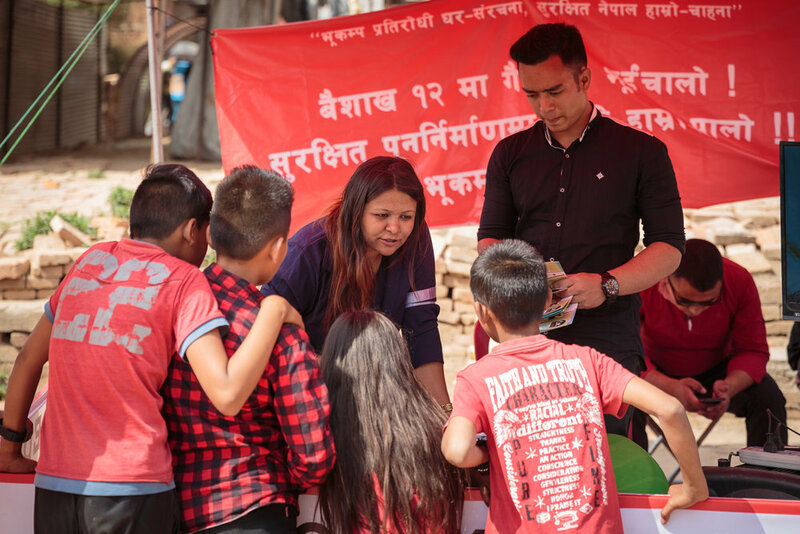 I know that there are many projects working tirelessly in Nepal and that without their aid and support, lives would be considerably more challenging. However, with such a large area to cover, any aid is inevitably spread thin. The leaflets are welcome and could very well save lives. I just wish there was greater evidence of support for those who have already struggled through one winter and who seem destined to struggle through more before their homes are rebuilt. Back in Kathmandu, preparations are underway for ceremonies to mark the anniversary of the earthquake. 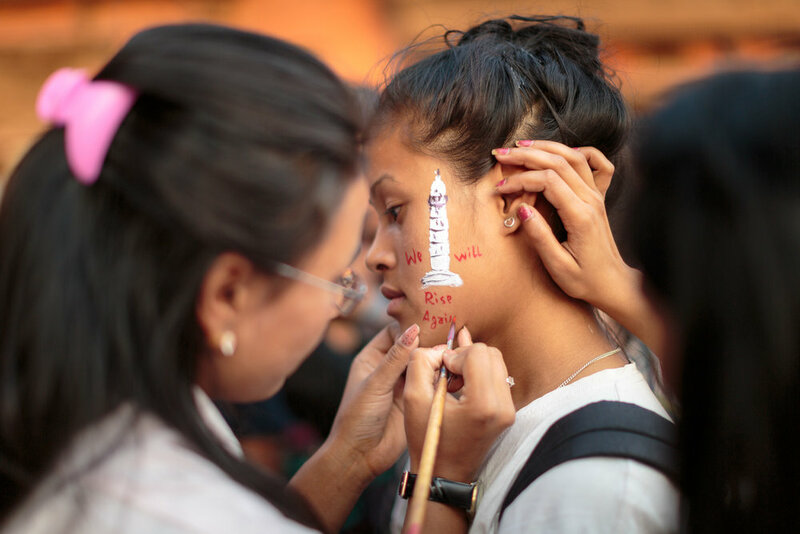 One group is offering to paint faces with a likeness of the Dharahara Tower. 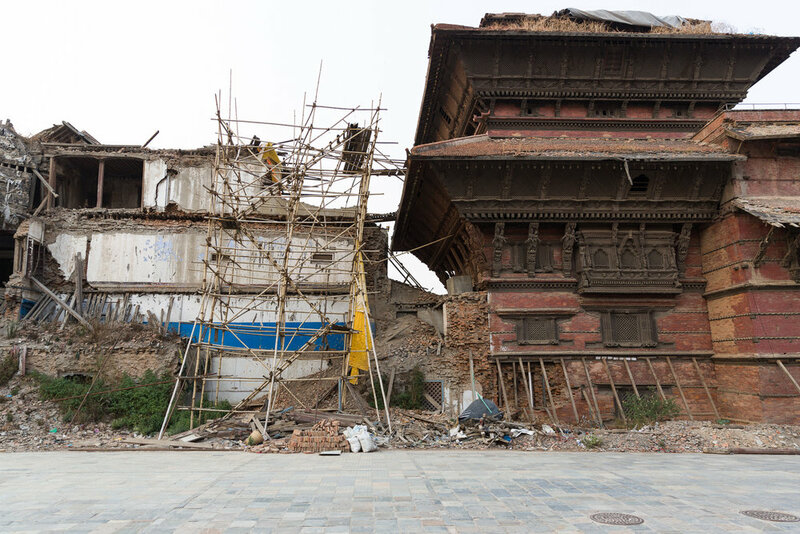 Once a landmark in central Kathmandu, the Dharahara Tower collapsed during the earthquake, killing 180 people. The tower has become a symbol of Nepal's hope for renewal. Students from a group called the Youth Initiative are staging a performance art piece. 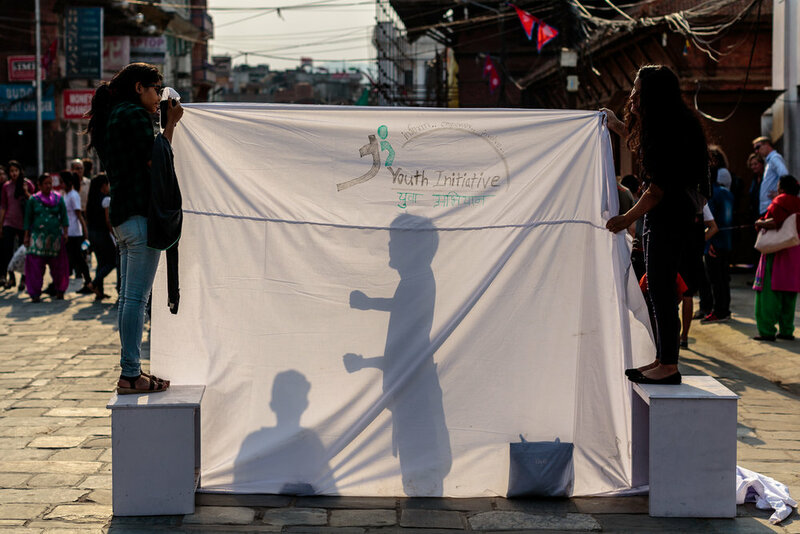 Passersby are invited to play out scenes from their own experience during the earthquake, forming graphic silhouettes on a white sheet. The audience view the impromptu performance from the other side. As the students explain, the sheet symbolises what they see as a narrow but definite divide between the earthquake victims and the Government. It's a metaphor that they're keen to expand upon. "The Government have not helped. They have received so much aid from the international community but they spend all their time making up fake projects and the money will disappear unless the people speak up and demand action." It's a common theme in my discussion with people in Kathmandu. I've yet to hear one voice in support of the Government. It seems that everybody I've spoken to, no matter whether they were significantly affected by the earthquake or not, feels that the Government have let the people down. It's been widely reported that pledges amounting to US$4.1 billion have been made yet the Government has so far failed to distribute even a fraction of those funds. The suspicion seems to be that corruption will dilute those funds and a few will get rich whilst those most in need will continue to struggle. 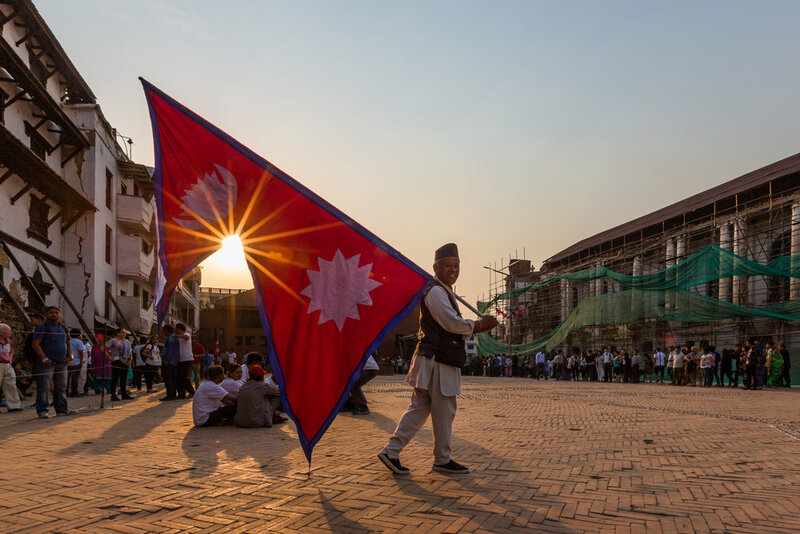 As various groups begin to place candles, a man carrying the Nepalese flag crosses Durbar Square. At 6:30pm, as the sun disappears below the horizon, volunteers begin to light 9,000 candles in the shape of Dharahara Tower. The words read "We Will Rise", a mantra that you'll see and hear whenever people in Nepal speak about the earthquake. On the other side of the square, the bamboo scaffolding provides a stark reminder of the work still to be done. Each of the 9,000 candles represents a life lost to the earthquake. 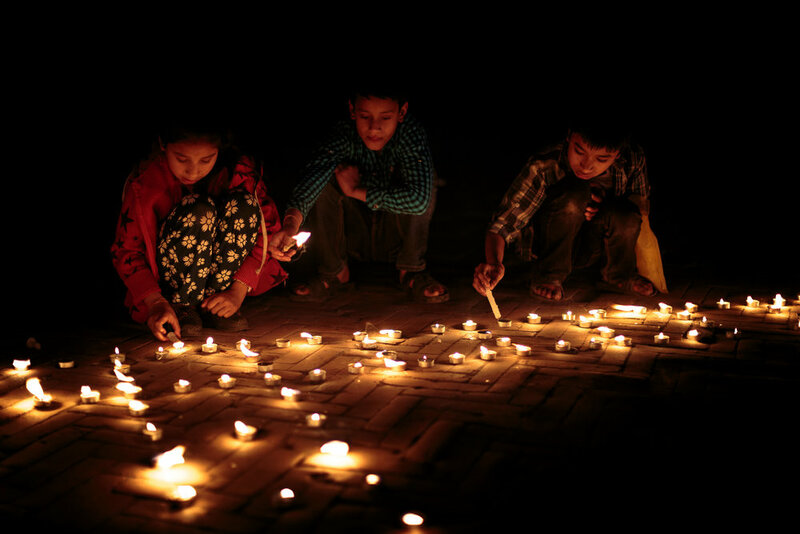 As the daylight fades, children keep the candles alight. I meet the parents of four year-old Evangeli. She is lighting candles and shielding them from the gentle breeze blowing across the square. She looks up, gazes directly into the camera but continues to protect the candle on the ground in front of her. I make a couple of frames. She is so intent on keeping that flame alive. At the end of a long day, I allow myself one fanciful, hopeful thought. I wonder what the future holds for Evangeli and children like her. Perhaps she'll be inspired by her childhood memory of lighting candles of remembrance. 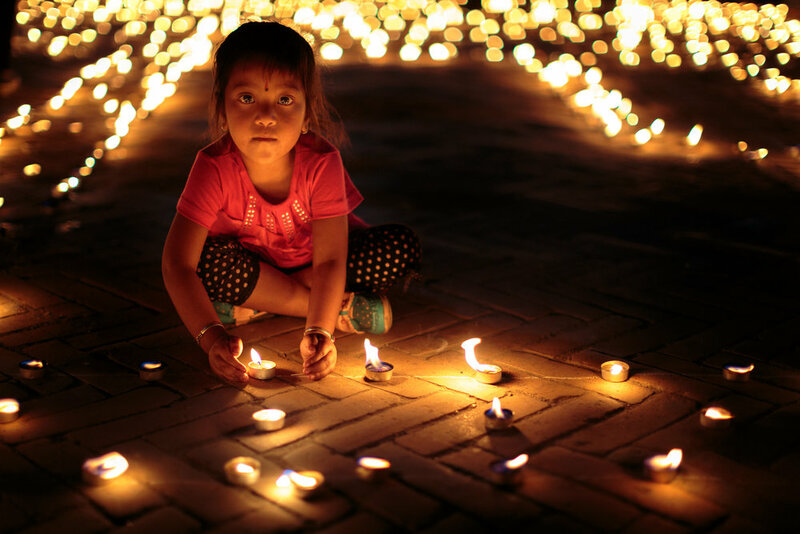 Perhaps she'll run for public office, become an elected representative and be moved to protect the people she represents with as much dedication as her younger self is protecting that candle flame this evening. 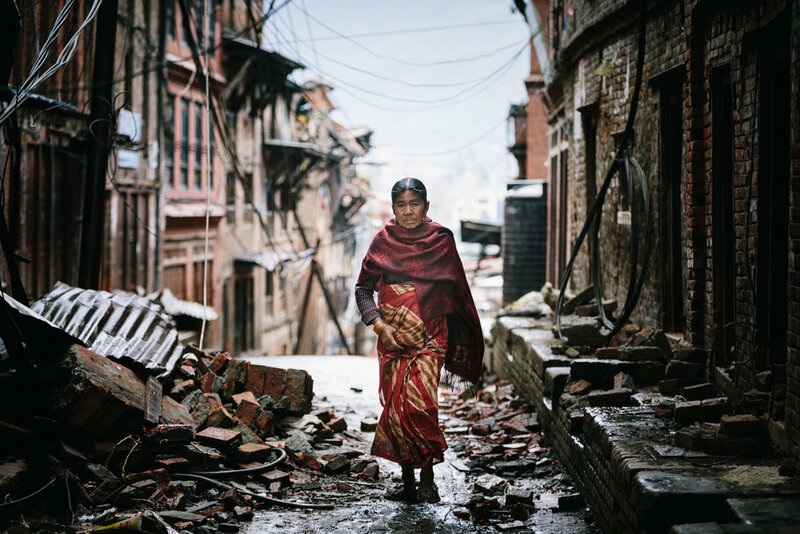 It seems to me that the people in Nepal who were so dramatically affected by the earthquake a year ago could use a little of that dedicated protection right now. Evangeli - hope for the future? If you're wondering how you might support the people of Nepal, there are many aid agencies working in the region. Personally, I'm involved with some groups who I know make a real difference with practical, straightforward solutions to pervasive problems. I recommend that you look at the work being done by Global Giving, Charity:Water and, my personal favourite, Splash. I've seen first-hand how these organisation can make a very real difference.